The cost of residential housing on Austin’s east side is increasing dramatically. For decades, homes located east of I-35 were occupied primarily by low-income residents. But strong population growth combined with increasing traffic congestion and limited new housing supply has led to an ongoing wave of east-side gentrification. Gentrification can be a double-edged sword. Improving the city’s housing stock and property values—good. Displacing the city’s underprivileged residents—not so good. The gentrification process is occurring in all major Texas cities. Many low-income folks on the east side will eventually be forced to relocate farther away from the city as demand forces prices higher and their property taxes become more burdensome. The area’s proximity to downtown makes it exceptionally attractive for expensive residential redevelopment and renovation. No doubt property values will continue to rise. However, the private sector offers a few alt​ernatives that lower-income residents may find appealing and reasonably priced. This article briefly discusses three affordable housing options currently available on the city’s east side: manufactured housing communities, the Mueller development’s affordable homes program, and accessory dwelling units (ADUs). Austin continues to attract new residents at a high rate. 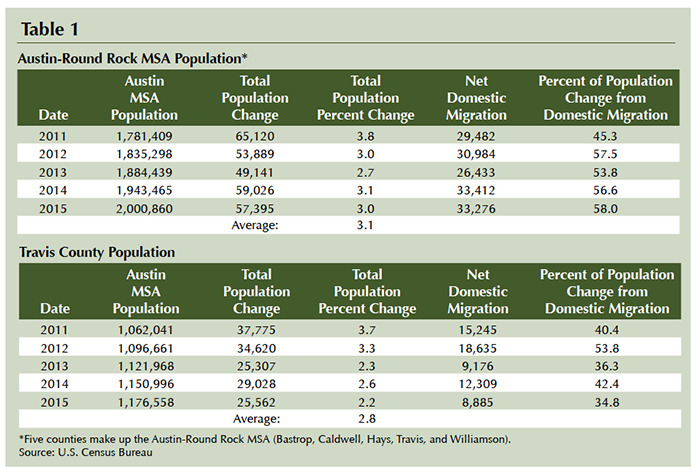 The five-county Austin-Round Rock Metropolitan Statistical Area (MSA) has averaged 3.1 percent annual population growth from 2011 through 2015 while Travis County has averaged 2.8 percent (Table 1). By comparison, the Texas population increased at 1.8 percent and the U.S. as a whole grew at a mere 0.8 percent during the same period. Much of the increase has come from people migrating to the Austin area from other parts of the state and country. At the MSA level, population growth due to a net increase in domestic migrants has exceeded 50 percent since 2012. This compares with about one-third for the state as a whole. The total population growth rate within Travis County has slowed, declining from 3.7 percent in 2011 to 2.2 percent by 2015 (Table 1). Part of this reduction could be tied to the increasingly limited affordable housing choices available to newcomers and locals in Austin. In their first quarter 2016 Home Affordability Index, RealtyTrac named Travis County one of its top 20 least-affordable county housing markets in America compared with the county’s own historical affordability norms. A number of the Austin area’s new residents are millennials, young professionals looking for a compact, walkable urban environment where abundant amenities are in proximity. Austin fits that profile perfectly. The commercial brokerage firm CBRE’s research group recently published a study titled 2016 Scoring Tech Talent. The study found that the millennial population (defined in the study as people aged 20–29) living in Austin’s downtown area had increased by 7.5 percent between 2009 and 2014. The city was also tapped by CBRE as the nation’s tenth most concentrated millennial market. As the city’s core continues to fill with young urbanites, east Austin’s proximity to downtown makes​ it more desirable for denser, more expensive residential development. Median closing sales prices in four of the six ZIP codes increased more than 100 percent during the study period (Table 2). 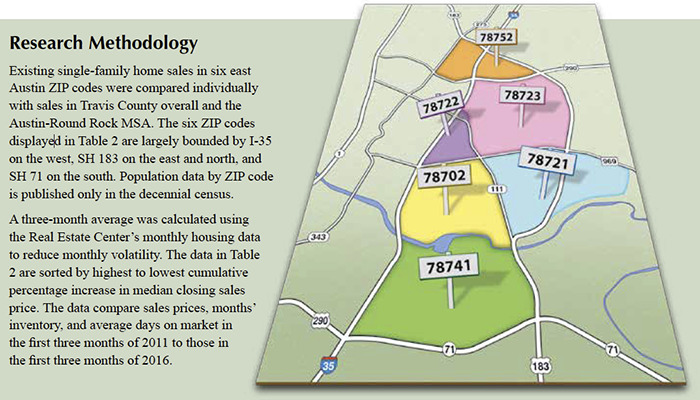 Growth in median prices in all six ZIP codes exceeded both Travis County and the Austin MSA. ZIP code 78722 registered the highest median sales price of $407,750, an increase of $170,417 since 2011. Increases in average sales price per square foot during the study period were also quite strong, ranging from a 161.5 percent increase in 78721 to 62.5 percent in 78752. Again, the percentage increases in all six ZIP codes were significantly higher than in Travis County and the Austin MSA. The highest-dollar increase in average closing price per square foot was in ZIP code 78702 with an astounding increase of $185.19 during the five-year study period. Travis County and the Austin MSA registered increases of $55.90 and $44.95 per square foot, respectively. Months’ inventory and average days on market numbers verify the tightening of existing single-family inventory for sale, another contributing factor to such large price increases. 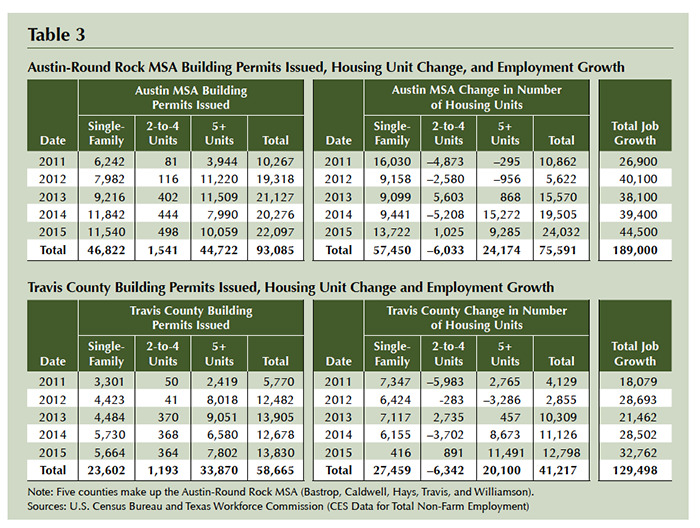 An annual comparison of residential building permits issued against the change in total housing units and total employment growth in Travis County and the Austin-Round Rock MSA is shown in Table 3. A lag should be expected between the time a permit is issued and completion of a housing unit. Changes in the number of housing units are calculated using annual U.S. Census Bureau American Community Survey estimates. The most obvious conclusion is the large disparity between the increase in total housing units and the increase in employment in both Travis County and the Austin-Round Rock MSA. Increases in housing stock are woefully inadequate for the employment growth occurring in the Austin region, especially in Travis County. Focusing on new single-family construction, the Austin real estate firm Pred Inc. produces a weekly publication advertising “spec” homes (those not being custom-built for a particular homebuyer) currently under construction in and around Austin. Their June 6, 2016, issue reported that 1,287 spec homes were under construction in the “greater Austin area,” a region that actually stretches beyond the Austin-Round Rock MSA. Of that number, only 24 were selling for under $200,000, about the maximum price a homebuyer earning Austin’s median household income or less can afford. Of those 24, only four were located in Austin’s far eastern fringe, a significant distance from downtown. The remainder were scattered throughout the region. The Texas Manufactured Housing Association estimates that there are 50 manufactured housing (MH) communities in Austin with a total capacity of about 7,500 lots. Zoning ordinances prohibit MH communities in the majority of the city. This prohibition has made it difficult for owners to locate (or relocate) their homes close to their jobs or job opportunities. Removing zoning prohibitions in Austin could increase MH supply, providing the city with more unsubsidized affordable housing. There are indications that this may be occurring slowly. In a December 2015 Austin city council meeting, Roberts Communities, owner of three Austin MH communities, was granted a rezoning. The decision changed 169 acres near SH 130 and Pearce Road adjacent to their Oak Ranch MH community from single- and multifamily zoning to MH zoning. Council members voted unanimously in favor of the rezoning after residents from another Roberts Communities MH park, Loma Vista, turned out in force to support the change at the meeting. Roberts Communities is also planning a “tiny home” community in Austin. A tiny home is loosely defined as having 400 square feet or less, either on wheels or a foundation. “One hundred tiny home sites will be another affordable housing option located within our existing Loma Vista manufactured home community,” said Scott Roberts, CEO of Roberts Communities. “Located off Decker Lane in east Austin, Village Farm will be an enriching community for people looking to simplify their lives by living in a progressive tiny home community integrated around an existing organic farm,” said Roberts. Village Farm will adjoin Green Gate Farms, a certified organic farm established in 2006. The Mueller Affordable Homes Program was created specifically to provide homes for families earning less than the area’s median family income (MFI) that might not otherwise be able to afford a home in East Austin. Community Wheelhouse, a nonprofit organization, administers the program. The goal of the program is to develop at least 25 percent of Mueller’s for-sale and for-rent residences as affordable units. These affordable properties are being located throughout the community and are basically indistinguishable from all other homes inside the development. The earnings limit to purchase a home in the Mueller program is 80 percent or less of the Austin-Round Rock MSA’s MFI. Different from median “household” income, which is a single number, median “family” income varies by family size. As of June 2016, 80 percent of MFI for the MSA was $62,250 for a family of four, dropping to $43,600 for one person. Homes in the program are sold for less than their actual market value. The difference between sales price and market value is reflected in a soft second lien held by the Mueller Foundation to support future affordability efforts. Buyers do not pay interest or make monthly payments on the mortgage and principal amount of the second lien for 30 years unless there is a default. The Mueller Foundation has the first right of refusal when a buyer decides to sell. According to documentation available on the Mueller Foundation’s website, David Weekley Homes currently builds units under the affordable home program that range in size from 841 to 1,439 square feet and priced from $159,990 to $284,000 with an additional second lien. Standard Pacific Homes also builds homes under the program from 1,145 to 1,175 square feet, priced from the mid-$170,000s. All affordable models must achieve Austin Energy Green Building three-star ratings. 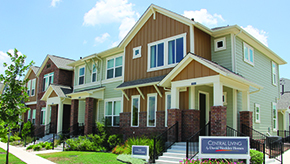 Complete program details can be found at http://www.muelleraustin.com/homes/home-types/affordable-homes/for-sale/. Accessory dwelling units (ADUs), also referred to as accessory apartments, second units, or granny flats, are additional living quarters on single-family lots that are independent of the primary dwelling unit. 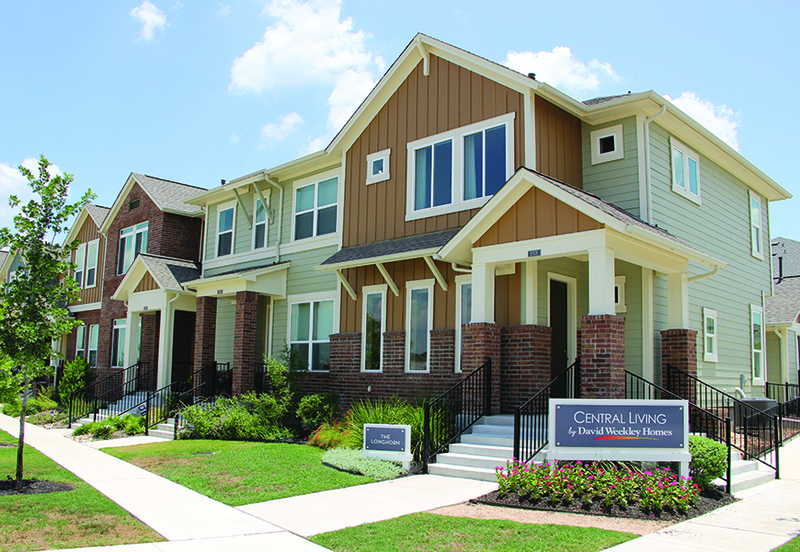 According to Nicole Joslin, executive director of the Austin Community Design and Development Center, the purpose of promoting more ADUs is to encourage residents to stay in their neighborhoods, provide them a way to generate rental income, and increase the affordable housing stock in Austin. folks who are into the mission of creating a dense urban neighborhood environment while generating some extra income as well. Although only a few hundred ADUs are estimated to have been built in Austin thus far, no solid statistical data exists. However, Joslin believes the number has increased somewhat since the city relaxed their ordinances pertaining to ADUs last year. Joslin reports that her group conducted a recent study that only looked at lots in SF-3 zoning of at least 5,750 square feet in size. They found 58,000 lots in Austin that are “eligible” for ADU construction. Of those, she estimates about 10,000 would not require additional parking. Portland, Oregon, a city with only slightly more than half the population of Austin, now receives permit requests for development of 200 ADUs annually according to the Austin-based nonprofit organization AURA. Portland was one of the earliest adapters of ADUs. Kol Peterson, editor of AccessoryDwellings.org and owner of Accessory Dwelling Strategies LLC in Portland, says Portland’s first ADU regulations started in 1981. However, they weren’t developed to any significant degree until 2010. Peterson believes Austin needs a good consumer webpage to help promote ADUs. “The city’s page (http://www.austintexas.gov/page/adu) explains some things but is missing all of the information average homeowners/developers need to actually build an ADU on their property,” says Peterson. He also suggested it would be helpful if a local credit union or bank came up with a good renovation loan product that could be used to finance ADUs. Obtaining financing is one of the biggest barriers to increased ADU development.